Drum Orchestra – It Takes a Village! | Musical IQ - Inspiring, Creative, Unifying & Fun! Home•Drum Orchestra – It Takes a Village! For ages 10 and up. Great for teens and adults. Drum Orchestra is a high energy group drumming program for kids (10 and up), teens and adults. 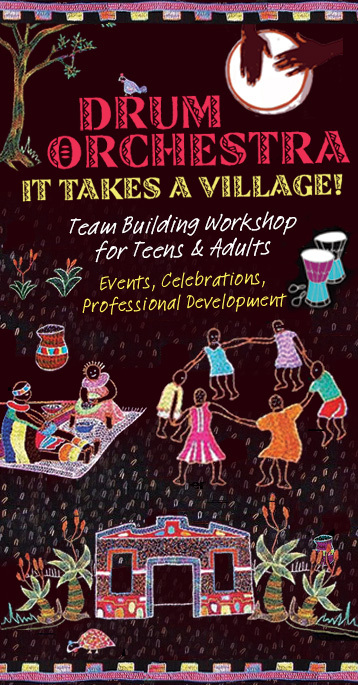 As the old African proverb teaches: “It takes a village… (to raise a child)”, we have come to learn that the power of collaboration and unity can achieve things beyond our wildest imagination. This program takes the drum circle concept to a new level and is fun, interactive, and high-energy. Each participant is given a drum and other percussive instruments to experience being a part of a rhythm orchestra – in which each small contribution is vital to the making of a unique musical creation. This program has a sense of humor and is fast paced, giving participants an experience and taste of the creative process. Following some fun and playful rhythmic exercises, designed to establish group coherence and to promote teamwork, the group will learn about the musical instruments and how to use them. Using guided rhythmic activities and instruction, the group will then begin to establish a simple layer of basic rhythm and continue layer by layer to build a unique and beautiful musical creation. This program will emphasize the power of collaboration and community. It promotes cooperation, demonstrates the value of effective communication and listening, illustrates the importance of diversity, awakens the creative spirit, and is a whole lot of fun! For availability, bookings and further info, please contact us.